The police arrested a man from Bloomfield for allegedly defacing a downtown Paterson plaque that honored a fallen firefighter, said police director Jerry Speziale. Detectives picked up Daniel Ponce from his residence at East Passaic Avenue in Bloomfield on Thursday at 1 p.m. He is charged with criminal mischief, according to police. 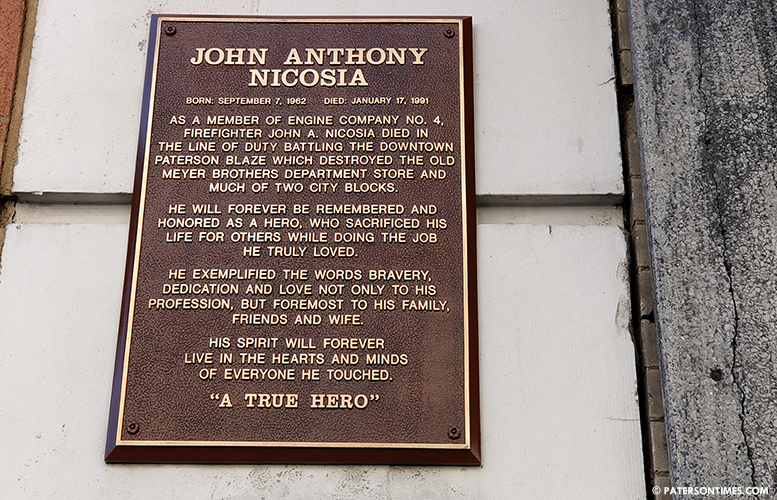 Ponce is charged with defacing the memorial at 186 Main Street erected in honor of John Anthony Nicosia, a member of Engine Company No. 4, who perished while battling the blaze at the Meyer Brothers department store. Fire chief Brian McDermott said union members noticed the defaced plaque. Charges were later field that led to the arrest. He said the bronze plaque was defaced with paint. It has since been cleaned up by firefighters. Nicosia was 28 years old when he lost his life. The massive fire that claimed his life happened on Jan. 17, 1991. His body was found two days later, according the Paterson Fire History website. Detective sergeant Rob Orozco and detectives Benny Ramos and Angel Gonzalez made the arrest.